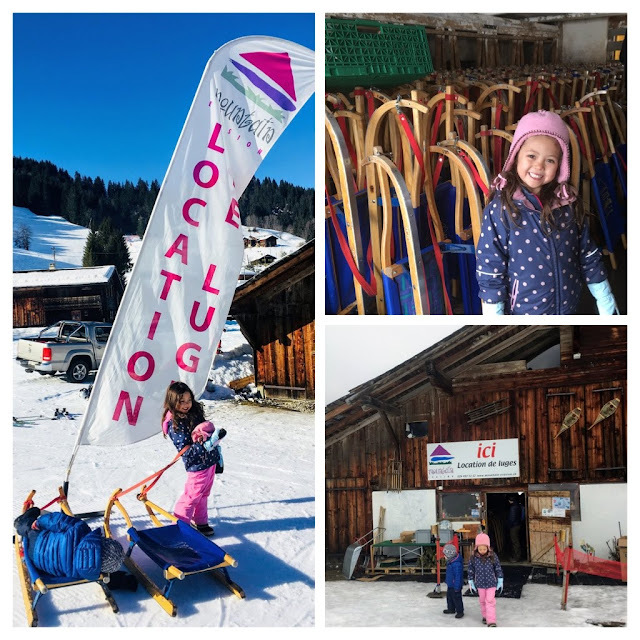 We drove an hour and forty five minutes from our home in Coppet to Les Diablerets. Once there we rented sleds ("luges") and then took the ski lift located behind the luge rental up to the top. We decided to rent 2 sleds so that we could share: Lucas rode with me and Eliana rode with Jonathan. From age 7 children can rent and "drive" their own sleds. Once at the top we found restaurants with outdoor seating and beautiful mountain scenery as the backdrop. We found the start of the luge trail just beside one of the restaurants. At the top: ski lift behind us and luge trail in front of us and to the left next to the restaurant. We were able to control our speed easily by dragging our heels in the snow. If you want to go fast it is possible by lifting your legs and steering only with the rope and by putting pressure on one side of the sled. Most people whizzed by us, however we made our way down the hill slow and steady with the children. They loved it! We parked at one of the main parking lots in the Les Diablerets ski area and then walked toward the luge rental which can be found next to the Creperie restaurant. There is a big white flag outside of the luge rental. The luge rental is CASH only. Each luge rental was 14 Euro for 3 hours. Next we pulled our sleds up behind the luge rental building toward the ski lift. Once at the ski lift, we purchased our ski lift passes. Ours were 41 Euro (with Lucas being free). We took the ski lift to the top - passing through one stop on the way where some skiiers decide to get off. Once at the top you have to get your sled and yourself (and children) off the lift. (NOTE: Don't forget to lower your safety bar after getting on the ski lift. Jonathan didn't realize he was supposed to lower any bar and it took him half the ride up before he realized he could close himself and Eliana into the lift safely). Lucas and I on the ski lift heading toward the top. The downhill descent is gradual with a few tight switchbacks. It was very easy to control your speed by dragging your heels in the snow and we also found this the best way to turn (by dragging the right foot, you turn right and by dragging your left foot, you turn left). The path down is solely for luges so you won't cross paths with skiiers or snowshoers. It also has walls of snow on either side for most of the way down so it would be very hard to get of track or fall off the side of the hill. It took us about an hour to make our way to the bottom. On the way back to return our luges we passed several casual outdoor eating areas serving frites, crepes and other simple snacks. These food areas were outfitted with lounge chairs to soak up the sun while resting your feet in the snow. We decided to return our luges and get crepes from the Creperie next door. It was a fun family outing that we look forward to trying again!